Today at a UFC press conference for UFC 196, fighters Nate Diaz and Conor McGregor took turns answering questions from different media outlets. At the end of the conference the two rivals posed for the face-off photo shoot, which nearly turned into a stage brawl as Dana White frantically tried to separate the two. 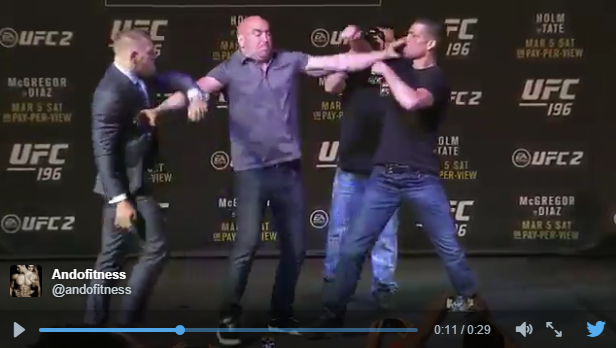 It looks like Diaz’s fist was a little too close to Conor’s face. Conor seemed ok with it, but only for a brief moment — until he decided that touching was crossing the line. That was all it took for tempers to flare and fists to fly.